A worthwhile look for many, stubble can enhance features, giving the illusion of maturity and wisdom, not to mention a more greatly defined jawline. It is also another great excuse not to shave every day. It cannot be stressed enough, but stubble should be approached with care and caution; whilst it can look awesome it can also register untidy if you’re not careful. Below, we recap our top tips for maintaining a perfect 5 o’clock shadow. Do You Look Good With a 5 O’Clock Shadow? First things first. Facial hair doesn’t look great on everyone so mindfulness to what suits you best is important. Distinguishing whether your face shape and features would complement surrounding scruff may just entail waiting for your hair to grow out so you can see what you will look like. Experiment with it! Also be conscious of whether you even have the ability to grow stubble so your face doesn’t look too bare. Whilst we recommend grooming and shaping your stubble, you’ll still want to sustain a natural look. The key is to ensure that your scruff isn’t too short. Utilise a beard trimmer or a good quality pair of scissors to trim your hair generally and around the edges, but keep in mind that you should go for a subtle trim and shape, rather than shaping your stubble with strict straight edges. Additionally, when using a beard trimmer, go for lighter strokes and less force, which will leave a more organic look. You will also need to establish a routine to maintain your stubble. Know how long your facial hair will get in a specific time frame and adapt your routine accordingly. Groom your stubble every 2-3 days to keep things looking sharp. Remember to exfoliate your skin beforehand and use shaving oils and gels to prep your stubble before a trim. Clip your whiskers to a uniform length and choose a setting that is one step shorter which will blend the edges to create a natural stubble. 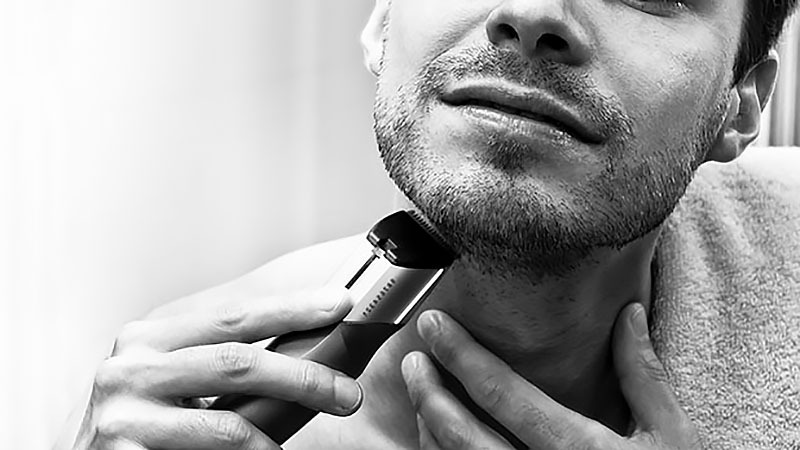 Don’t forget to use an aftershave to calm the skin from any irritation caused by the trimmer.